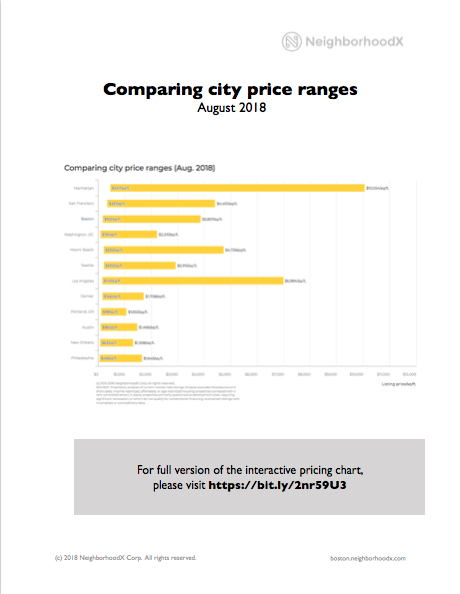 How do price ranges compare? An average asking price for a city can often conceal a significant price range. Sometimes, looking at the lower end of the market can give insight into the price of an entry-level property, while the upper end of the market puts the average asking price in a new context. With this in mind, we included the borough of Manhattan rather than New York City overall. The average asking price for Manhattan - itself the size of some cities - by itself puts other cities’ pricing into a new context. However, New York City overall would include the lower-priced outer boroughs, and this would bring the average price down and would obscure the true levels of Manhattan pricing. For Manhattan, prices drop as one goes further north. Inwood, the northernmost neighborhood on the island, has the lowest average asking price, and the lowest-priced market-rate property here (asking $447/ sq.ft.) offers a pricing floor for the island of Manhattan. To put this in context, the lowest-priced property in Manhattan (on a per-square-foot basis) is the average asking price in Los Angeles overall ($445/sq.ft.). The upper end of the Manhattan price range breaks the $10,000/sq.ft. barrier, and is reflected in several units at 432 Park Avenue South.